If you think this site isn’t updated often enough, you should see my professional one. I can’t help it if amazing comedy-things keep happening in Knoxville and by proxy my life! This week will include several of those, and here’s the party line for you all. First, what’s a super bowl? We’re going to do the most defiant open-mic in North America at Preservation Pub this Sunday night. Last year when this rolled around, I was at a Super Bowl party (that happened to fall on my girlfriend’s birthday, too, so I was kinda committed to being there despite not caring an ounce about the game). I checked my facebook and twitter feeds and it started physically hurting knowing how much pure comedanarchy I was missing. Apparently, Shane Rhyne shaved his beard off in increments over the course of the night and Jay Kendrick performed the same set about 4 times, each time drunker than the last and the final time underneath a table. Will these indiscretions repeat (or top) themselves this year? Only one way to find out. I may one day get sick of telling you all that QED is the best thing happening with comedy in the American South, but that day is still pretty far away. Shane Rhyne is hosting a comedic spelling bee. Let that one sink in. Shane’s handy banner here says it all! I’m headlining what’s basically a show full of headliners and headliner-worthy comics. It will also by my debut at the Station and will probably sell out. Facebook event with more info. Last summer, a trio of comics visited us from Columbus, OH (led by Dustin Meadows) and they blew the roof off of the Pilot Light. 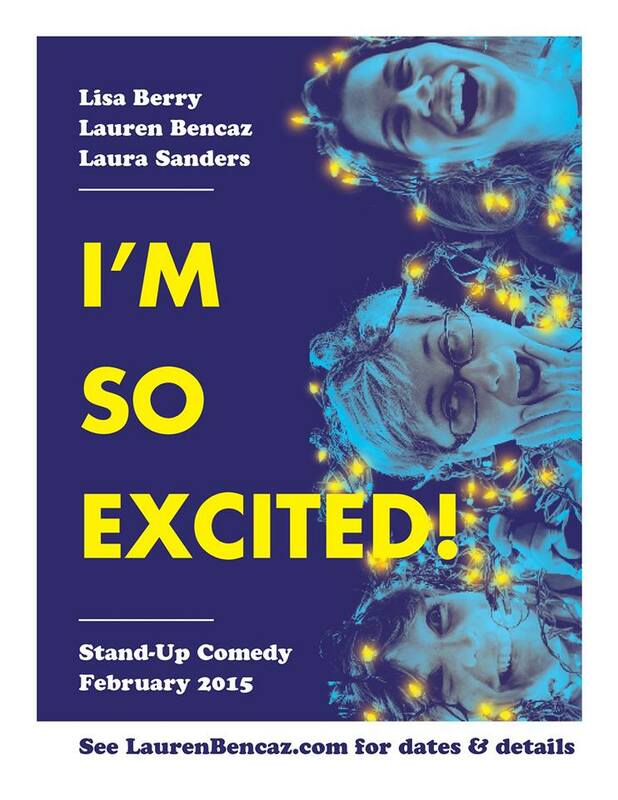 This time around, we’ve got three MORE hilarious travelers from that wonderful city – Laura Sanders, Lisa Berry, and Lauren Bencaz. I’ve been privileged to perform with all three on various shows in Ohio and I could not be more excited to have them in Knoxville. I’ll be hosting and Sean Simoneau and Jay Kendrick will be providing local support. I’ll leave you with some samples of the type of stuff you can expect on Thursday. Adieu. Tags: alex stokes, ian ferguson, jay kendrick, jeff blank, knoxville, knoxville comedy, laura sanders, lauren bencaz, lisa berry, matt ward, preservation pub, QED Comedy Laboratory, sean simoneau, shane rhyne, stand-up comedy, station comedy, super bowl, the pilot light. Bookmark the permalink.